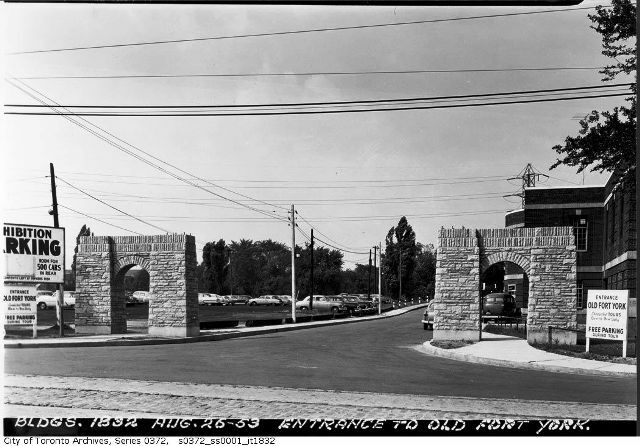 Entrance to Fort York, August 26, 1953. City of Toronto Archives. Fonds 200, Series 372, Subseries 1, Item 1832. Today, Fort York is generally considered to be one of Toronto’s most significant historic sites—which might lead you to believe the site has been consistently respected ever since the Americans left in August of 1813. The reality is quite different. 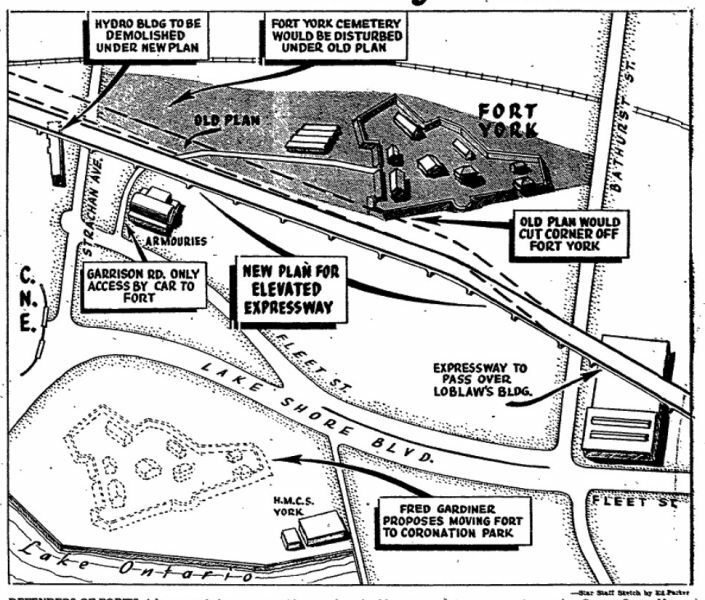 Fort York has endured both neglect and repeated attempts at redevelopment; what remains on the site today represents the effort of considerable advocacy and resistance to those circumstances, on the part of many Torontonians who thought the old fort worth defending. Some commemorations of the War of 1812 frame the end of the war as the beginning of two hundred years of peace, but this peace was anything but guaranteed. Changes to the fort continued after the Treaty of Ghent formally ended the War of 1812, and the threat of an American invasion was considered real for much of the remainder of the century; these threats included rising emotions based on the Trent Affair in 1861, the Fenian Raids following the American Civil War, and increased tensions of an 1895 boundary dispute in Venezuela. A local garrison was also necessary at times to guard against local uprisings, particularly following the 1837 rebellion, and through various political riots including those over the Rebellion Losses Bill. 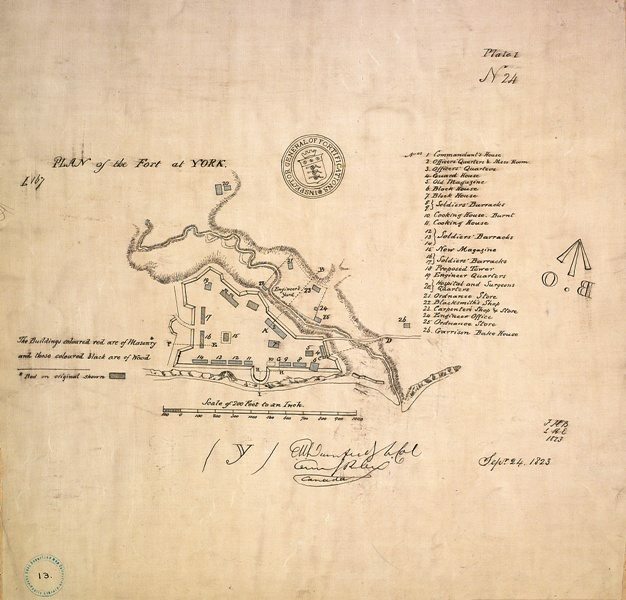 Map showing the fort in 1823. Image courtesy of the Toronto Public Library. During much of the nineteenth century, Fort York was deemed to be outdated and in major need of repair. Despite numerous proposals to replace or significantly reconfigure the fort, few redevelopments were implemented, and most changes during these years appear to be limited to replacing individual buildings. The most significant change was the opening of a new barracks in the 1840s (named “Stanley Barracks” in 1893), southwest of the old fort site. The old fort remained in operation after the opening of the new barracks, however, both for harbour defence as well as other military uses. 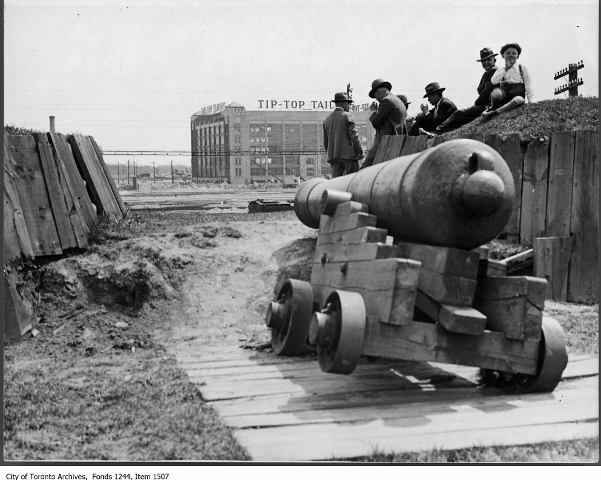 By the turn of the new century, many of the buildings at Fort York had been neglected for some time, and the area surrounding it was considered somewhat unsavoury. 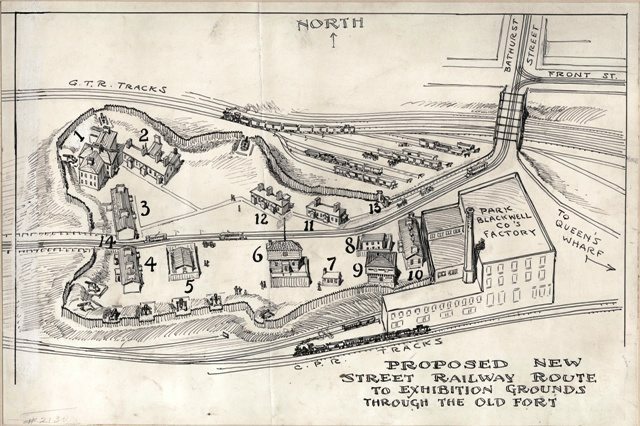 Despite the old fort’s active role in Toronto life, there were several proposals in the late nineteenth century which called for demolishing the fort buildings and redeveloping the site, either for railroad expansion or for residential development. These plans were all vetoed by the Department of Militia and Defence, on the grounds that they were still using the site for the Toronto garrison. Toronto, however, had other plans. It soon emerged that the City was not so much interested in the fort itself, but in the valuable land on which it sat. Despite the promise to maintain the whole of the fort property, within weeks of the purchase permission was granted to a meatpacking plant to encroach on the eastern part of the property, destroying both a bastion and a guardhouse, and unearthing the bodies of American soldiers. The Canadian National Exhibition was a growing enterprise at this time, and a very profitable one for Toronto. Although the original 1903 agreement anticipated a streetcar line running along the northern boundary of the property, plans emerged in 1905 for an extension of a streetcar line actually running through the site, necessitating the destruction of at least three buildings. Pen and ink map showing the proposed streetcar line through the fort. Image courtesy of the Toronto Public Library. Dozens of historical societies, including the York Pioneers, the Women’s Canadian Historical Society, and the Ontario Historical Society came into action, all protesting the City’s plan. Not only did these groups oppose the streetcar extension, but they called for the removal of the slaughterhouse which had been permitted to encroach on the property, citing the terms of purchase which forbade any use other than as a park and historic site. 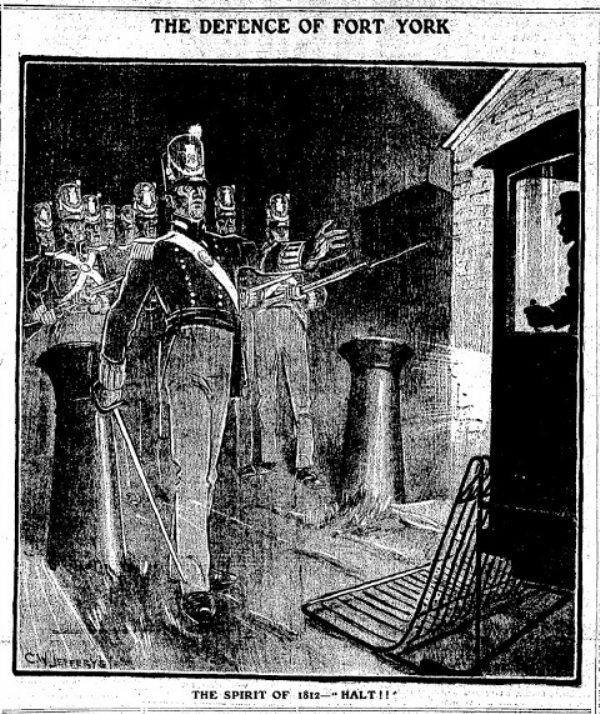 A cartoon from noted historical illustrator C.W. Jefferys, featured on the front page of the Toronto Star, October 11, 1905. As part of the January 1907 election, Toronto ratepayers were presented with a plebiscite over whether to bear the cost of the streetcar plan, with nearly 70 per cent of the vote rejecting it. The City was undeterred, and suggested a new plan the following autumn which kept the streetcar line running through the site, but which only required the destruction of one building, a barracks. An application was put to the Province of Ontario for permission to proceed with the plan without needing the ratepayers’ approval, but a vigorous campaign from heritage advocates ensured that the Province unanimously refused it. Fort York, ca. 1926. City of Toronto Archives. Fonds 1244, Item 1507. Despite this plan, it appears that no serious work was undertaken to restore the fort until the early 1930s, largely because many of the buildings were still occupied by the army. This changed in 1932, when Toronto recognized that restoring the fort would be a suitable project for the city’s centennial in two years’ time. Restoration work took place between 1932 and 1934, as a make-work program during the depression. Despite the continued importance of the site following the War of 1812, the restoration focused on the old fort as it was in 1816, at the time when its post-war reconstruction was completed. Not only were the remaining 1816-era buildings restored, but all the later buildings on the site were destroyed, presumably in a well-intentioned effort to be faithful to the fort’s 1816 appearance. 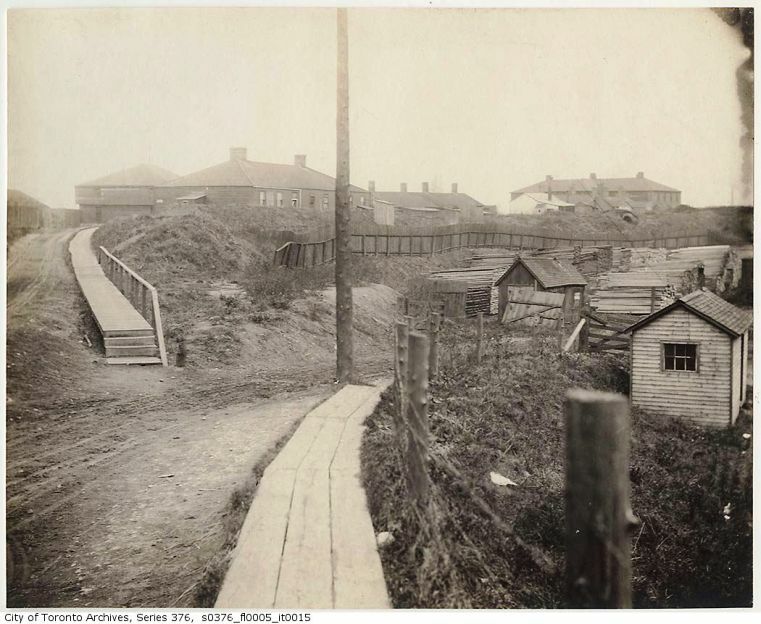 Fort York, probably in the 1890s. City of Toronto Archives. Fonds 200, Series 376, File 5, Item 15. This restored fort was unveiled to a sizeable crowd by the Governor-General, the Earl of Bessborough, as part of the 1934 Empire Day celebrations on May 24. According to the Mail and Empire, “the transformation of the Fort won the commendation of all visitors from the Governor-General down. The original plan has been followed, the redoubts rebuilt, the grass relaid, and a start has been made [at making] the Fort what it is destined to become: a national museum.” Most accounts of the restoration focus on the structure and terrain of the Fort, rather than on the interiors or exhibits. It appears that exhibits were supplied by various local historical groups, many of which had been involved years earlier in opposing the streetcar plan. With the success of the reopening of the fort, its future in Toronto at last seemed safe and secure. And then came the Gardiner Expressway. 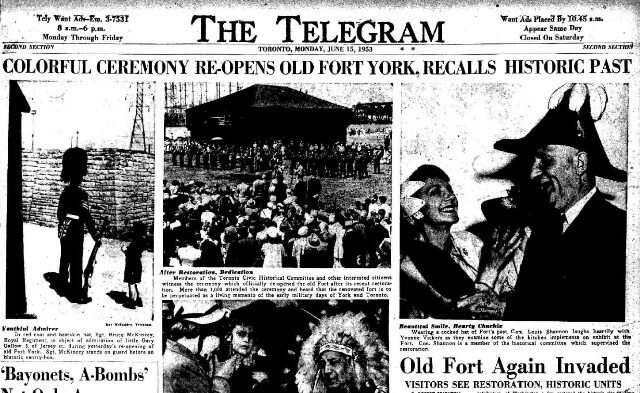 Photos from the opening of Fort York in the Telegram, June 15, 1953. Metro considered altering the route of the expressway, but found this option to be expensive, with the additional cost generally reported at $2,000,000. Furthermore, the roads commissioner for Metro, George Grant, claimed that an alternate route around Fort York would reduce speeds on the expressway from 50 to 30 km/h, severely reducing its effectiveness as an express route. The proposed plan for the Gardiner Expressway. The Globe and Mail, January 24, 1958. 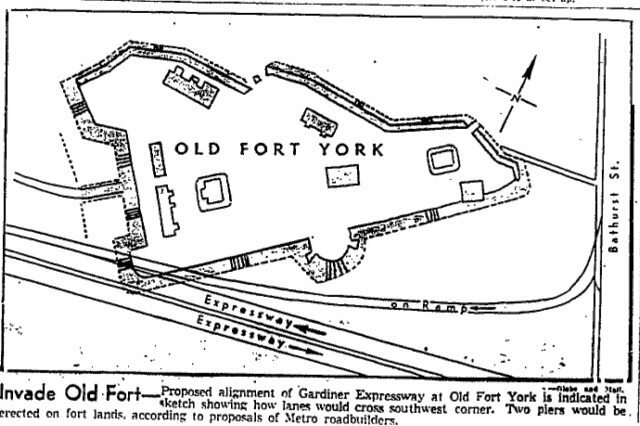 After visiting the fort in May, Metro Chairman Fred Gardiner announced that he was scrapping the plan to run the expressway through the site, and offered up what he considered to be a good alternative: the expressway’s route could be maintained if the entire fort was packed up and moved to nearby Coronation Park, where it would be safely out of the way. After all, the fort’s present location was inconvenient, and would be even harder to get to once the new expressway was built; in addition, the fort’s historical context was as a prominent fixture by the waterfront, but changes to the landscape meant that the fort was now considerably inland. As one Star article put it, moving Fort York to Coronation Park “would restore it to its original relative position and put it in a more attractive location and show it to the public as it was.” It was believed that this move could be accomplished for a mere $1,000,000, thereby making it $1,000,000 cheaper than rerouting the expressway around the site. The Toronto newspapers continued to run pieces supporting the scheme throughout 1958, imploring the heritage community to drop their objections and support the move. Heritage advocates continued to condemn the plan, eventually winning Fred Gardiner to their side, although not necessarily the rest of Metro Council. Gardiner was apparently not swayed by the historical arguments, but believed that the objections could result in legal challenges that would delay the timely completion of the expressway project. The cause of relocating the fort was picked up by Toronto Mayor Nathan Phillips, who continued to put public pressure on the rest of Metro Council to put it to a vote and push it through. The Toronto Star illustrating the various plans being considered. The Toronto Star, October 4, 1958. Additional material from: Carl Benn, Historic Fort York 1793—1993 (Natural Heritage/Natural History Inc., 1993: Toronto); Jean Earle Geeson, The Old Fort at Toronto: 1793—1906 (W. Briggs, 1906: Toronto); The Globe (and Mail) (October 23, 1903; October 4, October 7, October 18, 1905; April 25, 1906; January 2, 1907; July 16, 1908; June 7, 1932; April 27, 1933; May 8, May 24, May 25, 1934; June 11, 1953; January 24, February 4, February 25, March 12, March 25, March 26, March 27, June 19, August 25, December 8, 1958; January 15, January 21, January 21, 1959); Gerald Killen, “The York Pioneers and the First Old Fort Preservation Movement 1905—1909,” in The York Pioneer, Vol. 68, 1973; the Mail and Empire (May 2, 1934); Robert Malcolmson, Capital in Flames: The American Attack on York, 1813 (Robin Brass Studio, 2008: Montreal); John W. Scott, “Fort York” in The York Pioneer, Vol. 54, 1959; the Toronto Star (October 23, October 26, October 27, 1903; March 22, October 6, October 7, October 9, October 11, October 17, November 23, 1905; June 8, October 20, 1932; August 25, 1933; May 21, May 22, May 23, May 25, 1934; June 12, 1953; January 24, January 28, February 21, February 24, March 8, March 14, April 5, May 29, June 5, June 7, June 20, September 2, September 3, October 4, November 22, 1958; January 6, January 12, January 17, January 21, January 31, 1959); the Toronto Telegram (October 23, 1903; May 23, May 25, 1934; June 15, 1953; January 31, 1959).